530 User <username> cannot log in. Warning When you configure the site to require a user name and password, credentials and data are sent across the network in plain text and are not encrypted in any way. Information is susceptible to interception. After you clear the Allow only anonymous connections check box, we recommend that you use Secure Socket Layer (SSL) for your FTP site. Start the Internet Service Manager (ISM) ISM loads the Internet Information Server (IIS) snap-in for the Microsoft Management Console (MMC). Right-click the default FTP site folder, and then click Properties. On the Security Accounts tab, clear the Allow only anonymous connections security check box. In the Administrative Tools group, click User Manager for Domains.Note If the username is not a member of the default domain opened by User Manager, click the User menu, and then click Domain to specify the correct domain. If the username is a member of the local computer’s user list, type \\<computer_name> in the Domain text box. In the Rights drop-down list, click Log on Locally. Click Add, and add the appropriate username (or user group). Click Start, type MMC, and then click OK.
Click Console, click Add/Remove Snap-in, and then click Add. Select Group Policy, and then click Add. Make sure that the Group Policy object says Local Computer, and then click Finish. Add any users or groups that will use Basic/Clear Text authentication. Note Microsoft does not recommend that you install an IIS Web server on a Windows 2000 domain controller. The following steps describe how to configure Log on locally right by using Group Policy if it is necessary that you install an IIS Web server on a Windows 2000 domain controller. Double-click the domain controller for the domain. Double-click Default Domain Controllers Policy, and then click Finish. Open a command prompt, type secedit /refreshpolicy machine_policy, and then close the command prompt to refresh the policy. To give the username the Access this computer from the network permission, follow the same steps that are outlined in Resolution 2, but select the Access this computer from the network advanced user right. Try using the command line FTP utility and specify the FTP username in DOMAIN\Username format when you log into the FTP Site. If this works, then you can either instruct all users to log on by using DOMAIN\Username format, or you can specify the default authentication domain that the FTP Service should use when authenticating accounts that do not exist locally and that were not entered in the DOMAIN\Username format. To do this you must make changes to the Metabase. To specify a default logon domain so users do not have to type DOMAIN\Username when logging on to the FTP Server, you can either use the Windows Script Host (if it was installed during the Windows NT Option Pack setup) or the NTOP utility Mdutil.exe. Note In IIS 6.0, you can resolve this issue by modifying the metabase only when the FTP isolation type is “Isolated (Active Directory)” or if the UserIsolationMode property is set to 2. Change to the %Systemroot%\Inetpub\Adminscripts directory. Stop and restart the FTP Service. Make sure when you type the Domain Name that it is enclosed in quotation marks. Stop the FTP Service, and then restart the FTP Service. Change to the %systemroot%\system32\inetsrv\adminsamples directory. This sets Cscript as the default WSH interpreter. Copy Mdutil.exe. from the Windows NT Option Pack compact disc to the %WINDIR%\System32\ directory.Make sure to copy Mdutil.exe. from the appropriate platform directory on the compact disc. Open a command prompt, and change to the %WINDIR%\System32 directory. Make sure that <DomainName> is typed without quotes. When the command completes successfully, stop and restart the FTP Service. 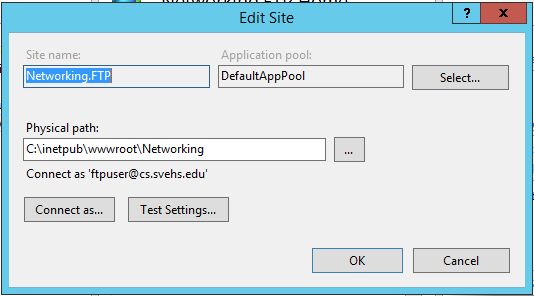 Open IIS manager, select the ftp site, right lick on the FTP directory browsing, select basic settings…, click connect as… to set the user from domain, then test settings, make sure, all passed. Make sure the user in the “Connect as” have read and write permission to the path listed above.